It's Not Work, It's Gardening! : Moudry! Grrrr. 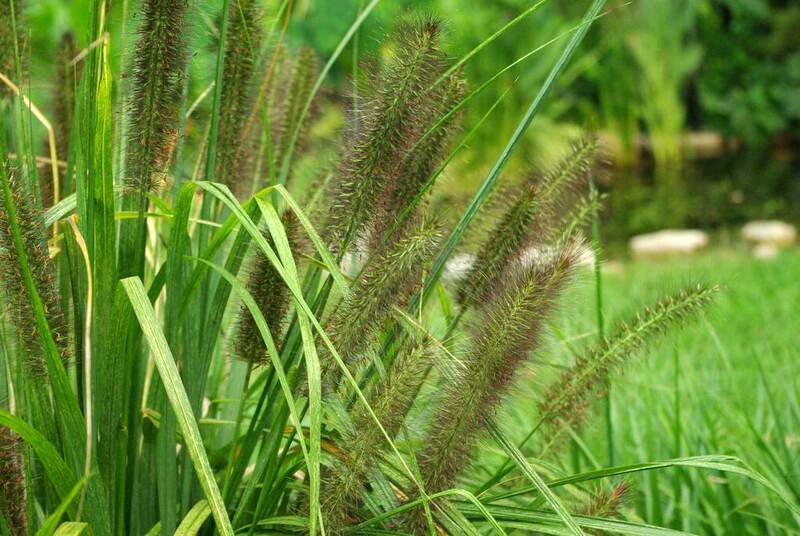 I post about this grass every year: Pennisetum alopecuroides 'Moudry', or "Black Fountain Grass". It's irresistible to those who haven't grown it before with those wonderful dark inflorescences, but I have to tell you... it's a pain. I've been removing the seed heads (the only reason to grow it really) for the past couple of years, but I still have seedlings coming up in the lawn. Well, they're really past being seedlings now. 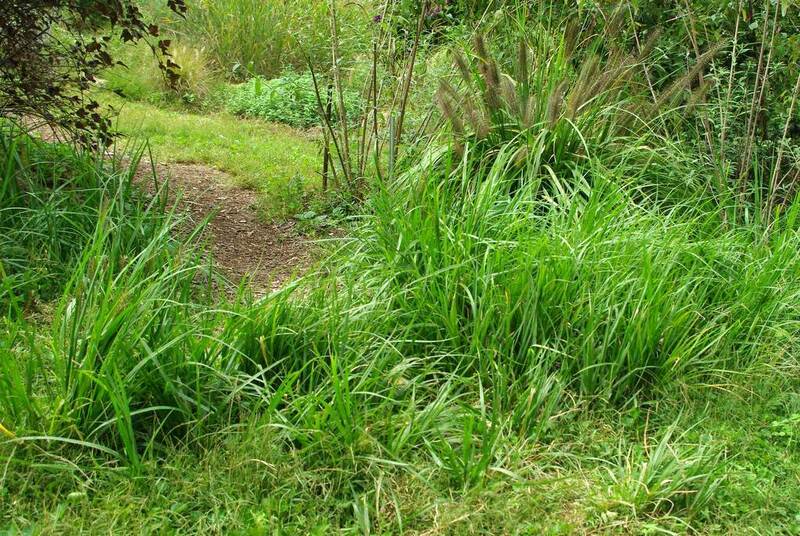 This grass reseeds more readily than almost anything I know, and will even seed into turf (lawns). One year I didn't remove the seed heads and I got lots of little baby Moudries around the plant. I had been pulling them out when I could, but never got all of them out. When mowing the lawn regularly you don't really notice them, except that they're much more coarse and stiff than any turf grass. This summer though there was a period of over two months where I never needed to mow (no water means lawn doesn't grow), and these seedlings really showed themselves. They've formed a little wall blocking my path from the driveway down to the pond area. In the next few weeks I'll remove the seed heads from the parent plant, and I'll be digging up all of these little ones too. A mass planting of mature 'Moudry' might look amazing, but one plant is enough for me -- I can't imagine having to deadhead more than one. 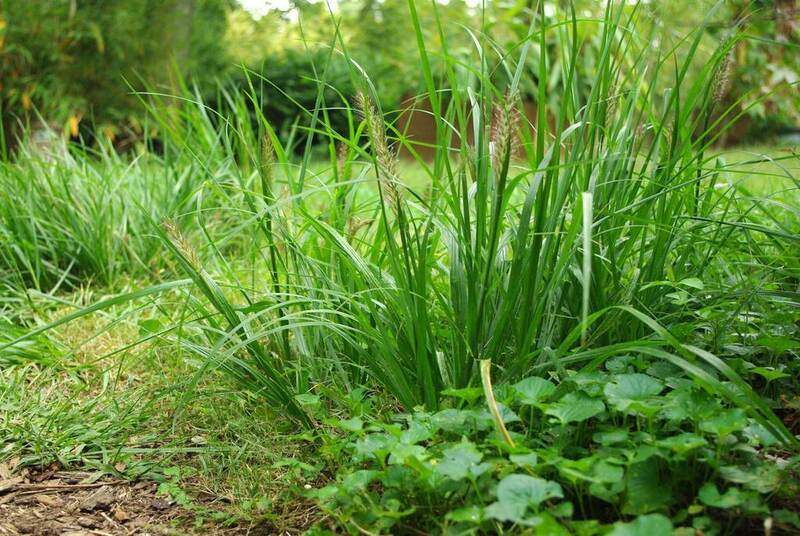 So, wonderful grass to look at, not so wonderful to grow. 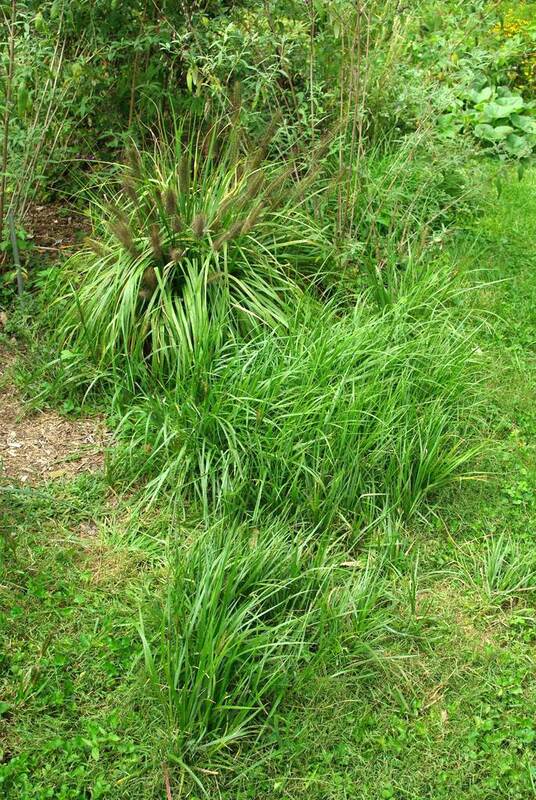 If anybody wants some of these seedlings of Pennisetum alopecuroides 'Moudry', please email me ASAP. Continental US only, and I'll be checking your state's invasive plant list to see if this guy is on it before sending. It's not recommended for rural areas where chance of escaping into the wild is great. Otherwise, my compost pile is getting a little nitrogen boost soon. I'm always curious why my 'Moudry' doesn't seem to reseed (and I'm VERY grateful for that)! Of course, here in Portland, they don't even start blooming until September (pretty much the last grass to bloom). While I still have 1 'Moudry', I've switched to 'Red Head' in subsequent plantings, similar blooms...but blooms months earlier...not sure if it has the same tendency to reseed as 'Moudry' does. I've been tempted by Moudry more times than one but the warnings have always put me off. This is clearly a case of too much of a good thing. 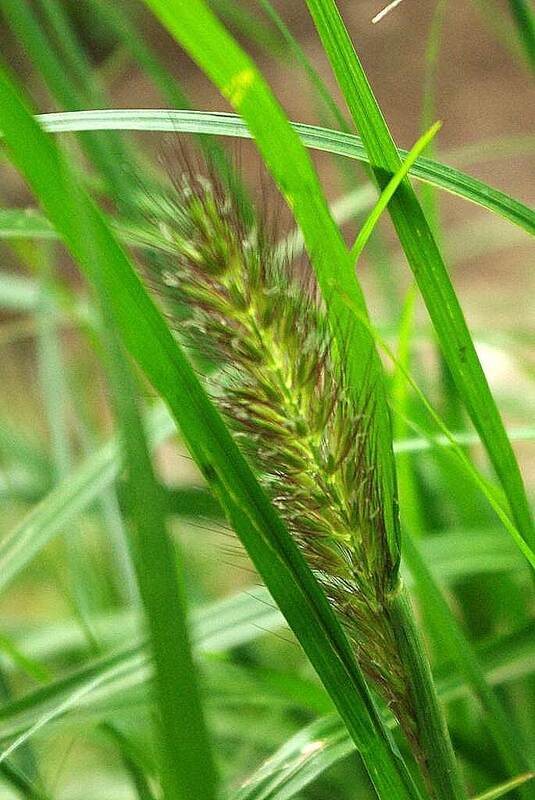 It's still a beautiful grass, though :-). Scott: I may need to check into 'Red Head'. 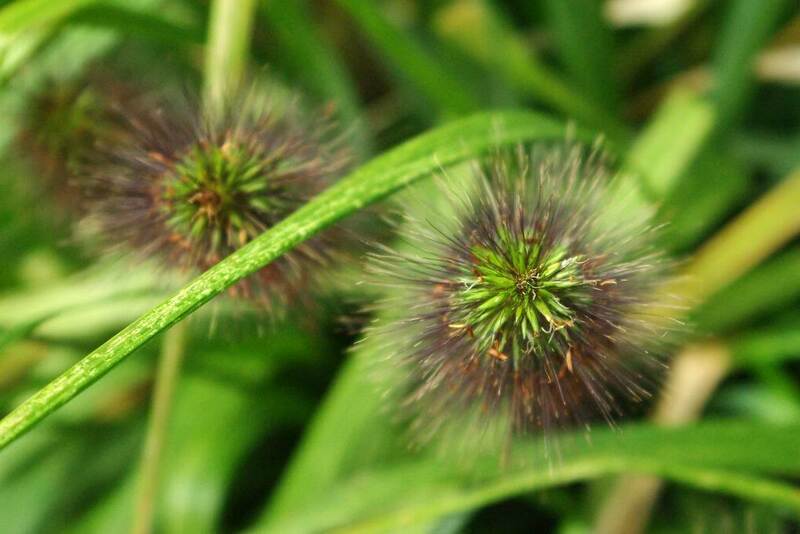 My first Pennisetum ever was 'Hameln', and I was excited to find that its seeds were viable. I grew a few of those seedlings and have found that they too reseed gently, so if 'Red Head' is gentle like that it sounds like a winner. I'm almost tempted to send you one (or 10) of my 'Moudry' seedlings to see if they reseed for you. So far the only thing that seems to grow well is the wild violets and the english ivy- and that took several years to really get going. P. setaceum is an invasive pest here; I feel your pain. The 'Rubrum' version is sterile, so I have one of those. 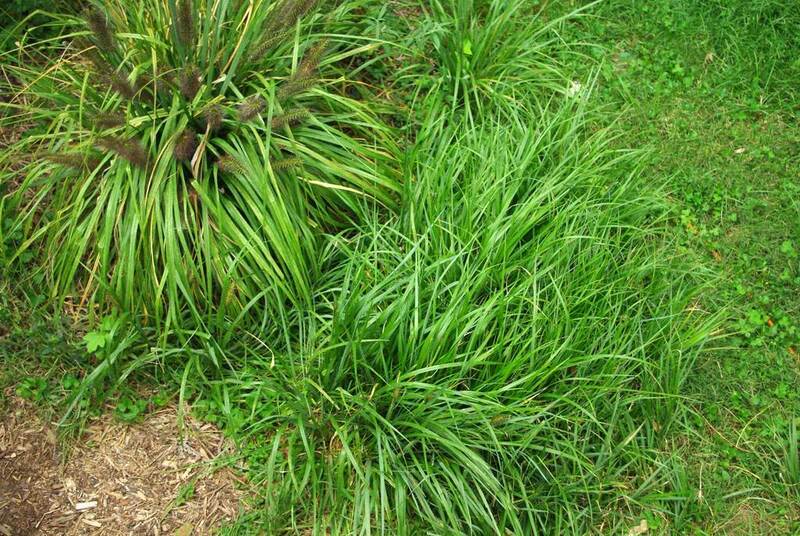 Grasses, I love them, but if they reseed, no way. Beautiful though!